I guess I was feeling southern this week because I feverishly searched out a recipe involving grits (call it “polenta” if you are feeling fancy),and in the end, my tummy was quite happy about the result of that quest! Chop and saute one package of smoked turkey sausage in olive oil. In medium saucepan, heat 4 cups of milk to a simmer. Stir in 1 1/2 cups of quick cooking grits. Place entire mixture in greased 9 x 13 pan and refrigerate overnight. In the morning, bake on top rack at 400* for 30ish minutes, until set and browned. Hello, delicious!!!!!!! I’m pretty sure I’d serve this “breakfast bake” any time of the day. I happened to pick out pepper jack turkey sausage which added an awesome spicy bite to the dish. Definitely let the casserole brown because the crispness of the topping was one of my favorite parts. I’m absolutely filing this away as “make again,” and I would totally serve it to guests! Very filling, very flavorful, and perfect size for sharing! ^Don’t skimp on the cooling time or you will inadvertently scramble the eggs! Posted in BreakfastTagged breakfast, brunch, casserole, Cook, food, grits, make ahead, overnight, polenta, sausage, southernBookmark the permalink. I’ve been experimenting with polenta this week after having found some at the back of the cupboard – I didn’t know it was also know as ‘grits’ – haven’t heard that here in London… thanks for the info! Here’s to polenta posts this week! I’ve always known polenta and grits to be the same thing, but when I found a recipe that called for polenta, and my local didn’t carry it, I did a little research. 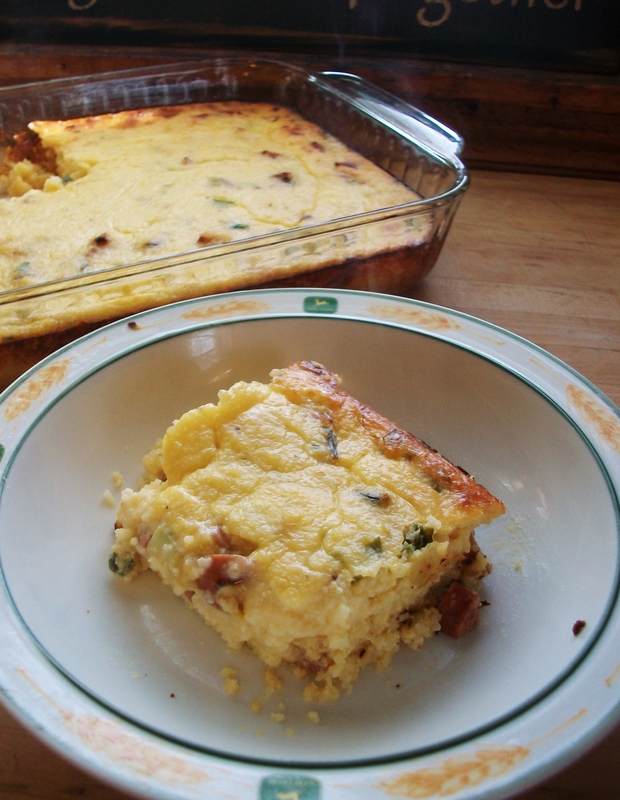 Both are defined as “cornmeal mush.” That sounds unappetizing, but they are DELISH in a casserole like this. Thanks for stoping by and happy cooking!